1 Happy New Year all. Last year I did record on the first day two centimeter of snow, sadly real winter weather seems further away than ever. My guess is it will be rather stormy than wintry the next couple of weeks. We will see what the future brings. 2 Some interesting iridescent louds at the Belgian coast. 6 Nice altocumulus lenticularis due to strong upper winds. 8 Deep low over northern parts of North Sea with gale force winds over Belgium. 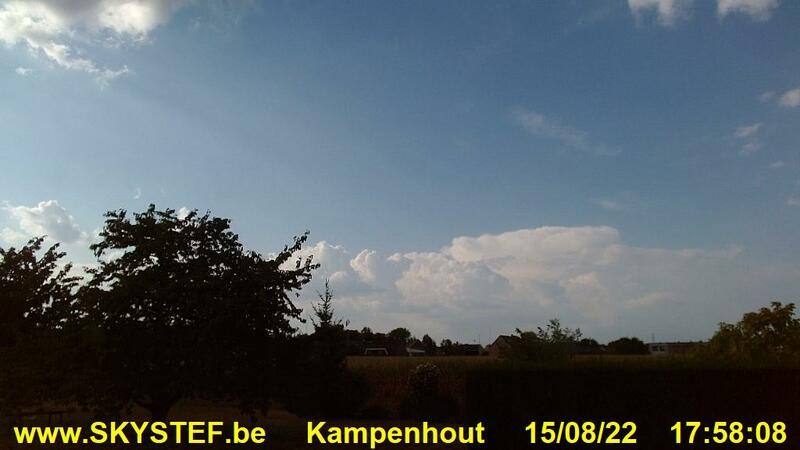 Highest gust at Zaventem was around 1400 on the passage of a line of slight showers: 52KT. On the cold front, a couple of hours earlier, Zaventem measured a gust of 47KT. Peak gust in Belgium was observed during forenoon at Ostend pier: 54KT. 10 Sadly still no sign of real winter weather in the near future. On the contrary it was record warm today with highest maximum temperature at Kleine Brogel 14,9°C, followed by Retie 14,5°C, Deurne 14,1°C, Zaventem 14,0°C. 13 A bit colder in a NW'ly airflow. 14 Last subzero was 18 days ago. This morning I measured -2,4°C with hoar frost. Coldest place in Belgium was Brasschaat: -3,5°C. A few sunny winter days are on its way. A power plant produced this nice industrial cumulus cloud. 15 Coldest place in Belgium this morning: Elsenborn: -7,1 in the air, -14°C at surface level ! 16 This morning -4,6°C in my garden. Lowest value in Belgium: -6,5°C at Kleine Brogel. Nice sunset. 18 Observed a few wet snow flurries this afternoon after a rainy night. Until now the winter performance is rather poor with only some snowflakes on November 19 and December 28. 19 Last night did observe some showers of soft hail. Mont Rigi measured this morning a cover of 9 cm snow ! For the first time this winter season an interesting omega block pattern seems to appear on the weather maps, from this weekend onwards. At level 850 hPa the -10°C isotherm seems getting quite close, so fingers crossed for some "real" wintry sceneries in the low parts of Belgium. 20 Wet & windy today, but "the news" is the confirmation of a wintry trend on the weather maps. 21 Heavy rain (total of 8 mm) and severe gusts of 43KT just before and on the passage of the cold front last midnight. 22 Some hoar frost this morning with Tmin 1,3°C. 23 Frosty night with a Tmin of -0,8°C. Tonight I finally hope to see my first snow cover of the season. 24 Around 0300 a snow shower produced the first (partly) snow cover of this winter season in my area: 0,5 cm. Temperature dropped to -0,8°C and some roads were quite slippery. Max temperature was 3,4C. During the day snow activity was limited to two late afternoon showers, leaving again some "white dust". Check out the full pictorial report of today. Seems the omega block pattern stays for at least a week, so wintry weather ain't over yet. Elsenborn had this evening a snow cover of 17cm. 25 Slight snow around 0600 this morning, leaving a "trail of dust" on the ground. Tmin was -3,2°C. During daytime I saw the passage of two slight snow showers, but no lasting cover. Tmax 1,1°C. Lowest Tmin value in Belgium Elsenborn : -7,1°C and in the evening a snow cover of 20cm. 26 A day without history, Tmin was -3,9°C, Tmax 0,1°C. Lowest value in Belgium: Elsenborn with -6,9°C which barely rised to -5,7°C. Although the omega block pattern stays, milder air is on its way, probable starting "a wintry battle" on the evening of the 27th. 27 So this must be D-day for my first full cover of snow. Tmin was -3,2°C, Tmax 1,6°C but now descending. The first precipitation trails on the radar are on its way, this evening/night it "should be snowing" ! 28 So it did snow, but with 0,5 mm in the collector it didn't produce a descent cover. On the contrary, the slight snow turned into slight drizzle and it finally became dry with mist and fog. Lowest Tmin was 0,6°C. So the real wintry weather stays in the box until further notice. 29 A touch of frost this forenoon with Tmin -0,1°C, observed around 1000. Quite sunny day with later invasion of Sc Ac sheets. Still lovely wintry conditions in the higher parts of Belgium: at Elsenborn Tmin -11,0°C with a snow cover of 20cm. 31 The month is ending with quite boring weather in a weak NW airflow giving lots of Sc cloud fields. Over Ardennes melting of snow also began, maximum 15 cm today and further diminishing.